Moon orbits third largest dwarf planet. 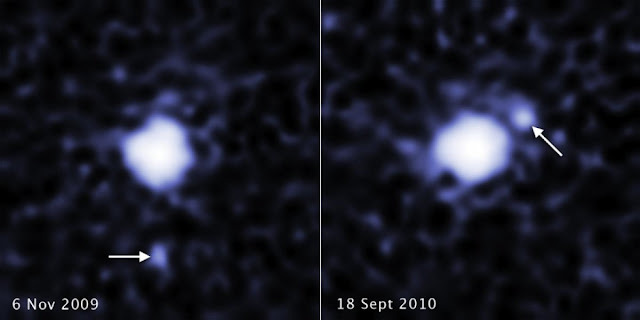 Combining the power of several space observatories, including NASA's Hubble Space Telescope, astronomers have uncovered a moon orbiting the third largest dwarf planet, catalogued as 2007 OR10. The dwarf planet is about 1529 kms across, and the moon is estimated to be 241 kms to 402 kms in diameter, the researchers determined. Like Pluto, 2007 OR10 follows an eccentric orbit, but it is currently 3 times farther than Pluto is from the Sun. The dwarf planet 2007 OR10 is a member of an exclusive club of nine dwarf planets. Of those only Pluto and Erise are larger than 2007 OR10.